By Prieur du Plessis, on July 19th, 2010 posted in: Economy, Guest Bloggers 2 people had their say - chime in! 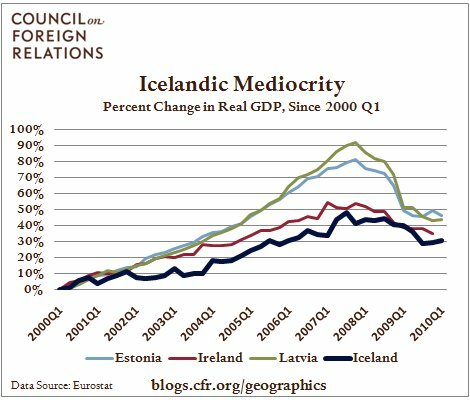 To back it up, Krugman provided a chart (below) comparing the GDP of Iceland to Ireland, Latvia and Estonia since the 4th quarter of 2007. The chart does seem to support his view, as it illustrates Iceland appears to be enjoying a much higher growth rate than the other three European Union (EU) members. While this NYT article has probably recruited a few newbie Keysians, it is totally screaming for a rebuff … considering Iceland pretty much went belly up in 2008 with the collapse of its three largest banks, and has been in crisis mode ever since. As expected, here is a rebuff by the Council on Foreign Relations (CFR). 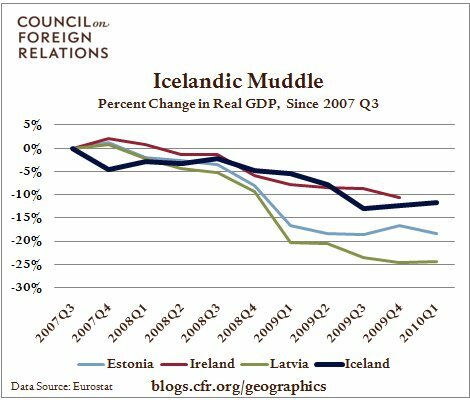 The CFR finds that Krugman’s “Icelandic Miracle” is “an illusion” created by simply choosing a starting date to make it fit into his “debt is good” mantra. 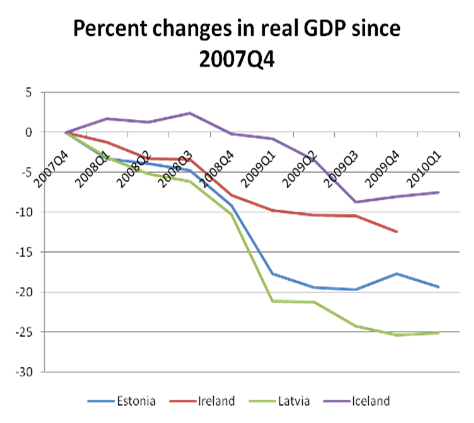 The CFR generated the same GDP chart, but shifted the starting period by one quarter − from Q4 2007 to Q3 2007 − the quarter before Latvia and Estonia’s GDP peak. The result − Iceland’s GDP picture looks a lot less impressive. Here is another chart by the CFR with the starting date moved back to the beginning of 2000, which totally crushes the “miracle” story of Iceland. Part of Iceland’s economic progress may be attributed to a massive currency devaluation and “technical defaults”, which seems to be what Krugman is intimating as the “solution” to “a really, really bad crisis”. However, in Iceland’s case, the devaluation and refusal to pay have not resolved its fiscal mess. Now, the island could face a second round of bank failures. The government, already on $4.6 billion life support from the IMF, recently warned that a second bank bailout would be a “severe blow” to its finances. Iceland did secure a $500 million currency swap deal from China in June of this year. However, rather than a vote of confidence in Iceland’s economic recovery, this handout most likely serves as a strategic interest of Beijing amid the ongoing international squabble over the Arctic oil. Eventually, beggars can’t really be choosers when it comes to lender of last resort. Moreover, currency devaluation and debt default will not absolve all spending sins. Greece vowed not to be the next Iceland, and other nations should take note − including the United States. Source: Dian Chu, Economic Forecasts and Opinions, July 16, 2010. Wikipedia states the Icelandic crisis started in Sept 2008. Therefore, the most relevant period to discuss is maybe 2008 Q3 to present and more likely 2008 Q4 to present. To go back before this period would have the value of providing relative trend information only. The starting point for the trend part has no obvious value. Your piece gave me the link to “Now and Later” (http://www.nytimes.com/2010/06/21/opinion/21krugman.html?partner=rssnyt&emc=rss). It is astonishing to read this man (I don’t as a rule). It would take me have an hour to detail the lack of rational connection between his glib nonsequiturs – if I cared to, and I don’t. Krugman has lost it, if he ever had it, something which a lot of people are beginning to doubt. He is a loose cannon, doing everyone, including both real Keynesians and himself, a very bad favor. He must have forgotten his Philosophy 101 logic. It has certainly escaped him, but since he is so emotionally aggressive and belligerent I am not surprised. He wants to take out the baseball bat on China and threatens to hit his next critic on the kisser. The man is so myopic and pig-headed he is obviously incapable of seeing the bigger picture and thinking outside the box. He normally rants on about more stimulus needed to avoid a crisis but in the Iceland case appears to think a bad crisis is the way forward. How these two approaches are reconciled is way too much for him to explain, since they are contradictions. As many have pointed out, at some point the defaulter has to come to terms with the creditor, or leave international trade. Case in point is Argentina, still battling with the aftermath of default. Krugman knows he cannot explain the crisis or how his solution would work so he just grasps at straws using the cheap tricks that would get an 9th grader a failing grade for a project. We see his tricks here – narrowly excerpted statistical snippets or graph sections, and he extrapolates wildly from there. And this is supposed to be the top Professor in Economics of the United States? Hmmm. And again. Hmmm.